The educator’s role has or should change in this age of information abundance or Education 2.0-3.0. The educator’s role has always been to model and demonstrate effective learning, but somewhere along the line, the major role of the educator became that of content and knowledge disseminator. Now in this information age content is freely and abundantly available, it is more important than ever to assist learners in the process of how to learn. The world is changing at a rapidly accelerating pace. What you learn today can quickly become outdated. HOW to learn, though, is a skill that lasts a lifetime. When you think about it–it makes sense for us to be taught how to learn before we are taught any specific subject matter. But rarely, if ever, does that happen (http://www.huffingtonpost.com/gurbaksh-chahal/learning-how-to-learn-wha_b_4790668.html). A major role of the educator is or should be to model or demonstrate the hows or processes of learning! Research has shown that modeling is an effective instructional strategy in that it allows students to observe the teacher’s thought processes. Using this type of instruction, teachers engage students in imitation of particular behaviors that encourage learning (http://www.learnnc.org/lp/pages/4697). 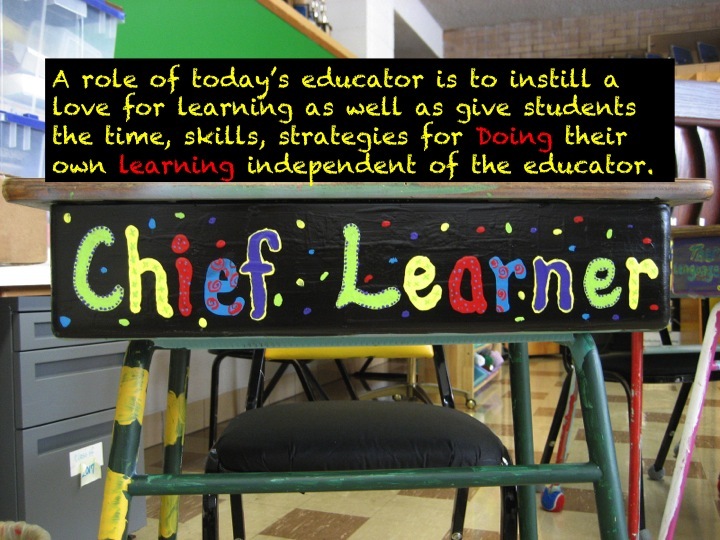 In some educational arenas, educators are being titled as lead learners to emphasize and model the educator as a learner. Modeling of learning processes needs to be intentional, strategic, and overt. 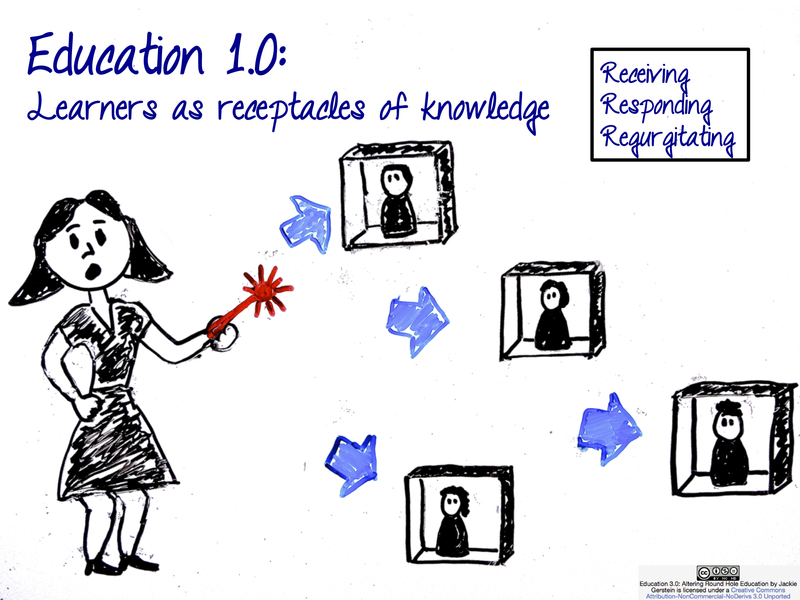 The educator should be familiar with and able to demonstrate metacognitive processes. 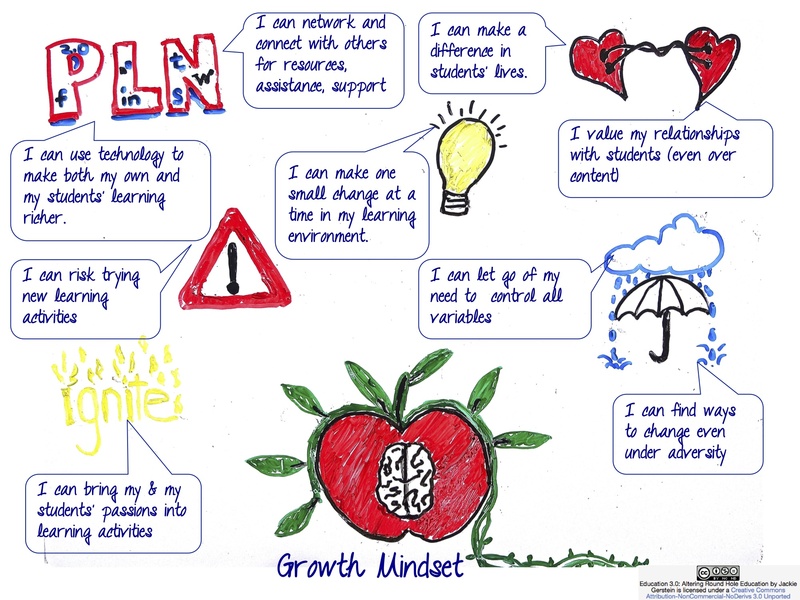 “The most effective learners are metacognitive; that is, they are mindful of how they learn, set personal learning goals, regularly self-assess and adjust their performance, and use strategies to support their learning” (http://sites.cdnis.edu.hk/school/ls/2011/05/12/teachers-as-lead-learners/). For authenticity purposes, the teacher – lead learner should model learning something s/he previously did not know. Technology has changed the way people access and learn information and procedural knowledge, educators should demonstrate how to learn using technology. Teacher education would need to devote more time, opportunities, and strategies for pre-service teachers to learn about metacognition, how people learn, and how to model-demonstrate-teach the process of learning. The educator, him-herself, would need to develop an attitude of the importance of assisting students how to learn. The systems of education would also need to focus on the process of learning as a top priority or skill for students to develop. 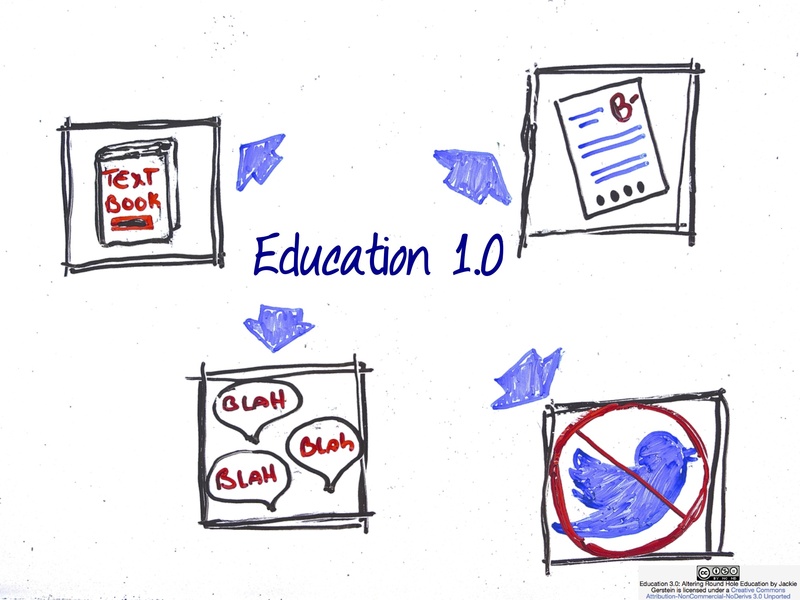 Education 1.0 can be likened to Web 1.0 where there is a one-way dissemination of knowledge from teacher to student. 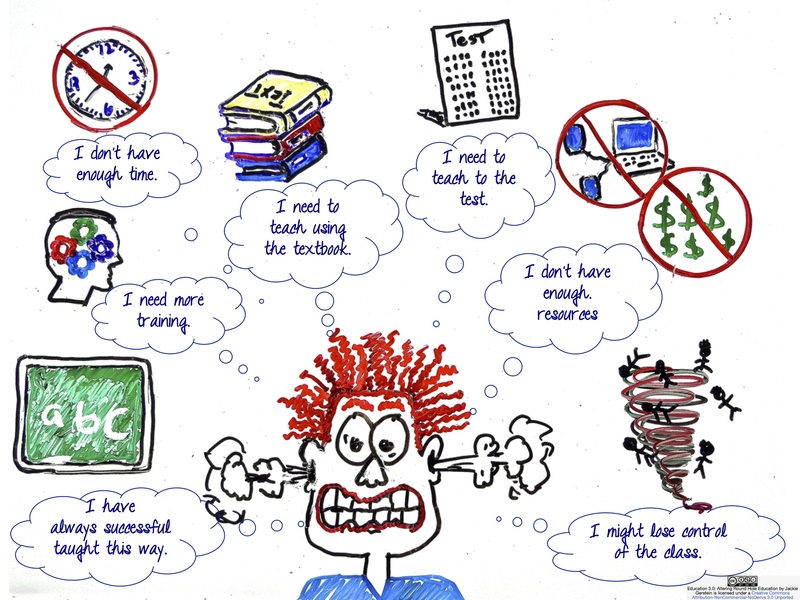 It is a type of essentialist, behaviorist education based on the three Rs – receiving by listening to the teacher; responding by taking notes, studying text, and doing worksheets; and regurgitating by taking standardized tests which in reality is all students taking the same test. Learners are seen as receptacles of that knowledge and as receptacles, they have no unique characteristics. All are viewed as the same. It is a standardized/one-size-fits-all education. 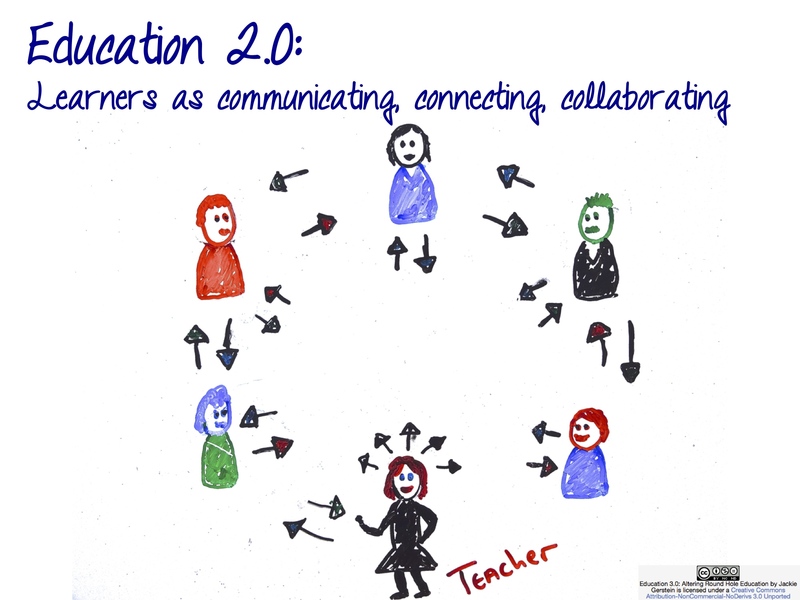 Similar to Web 2.0, Education 2.0 includes more interaction between the teacher and student; student to student; and student to content/expert. Education 2.0, like Web 2.0, permits interactivity between the content and users, and between users themselves. Education 2.0 has progressive roots where the human element is important to learning. The teacher-to-student and student-to-student relationships are considered as part of the learning process. It focuses on the three Cs – communicating, contributing, and collaborating. Emerging technologies is, can be, should be a driving force of this evolution towards Education 3.0. Information access, communication methods, the ability for creative express is qualitatively different than any other time in history due to technological advances. The SAMR model was developed by as a framework to integrate technology into the curriculum. I believe it can also serve as a model to establish and assess if and how technology is being used to reinforce an old, often archaic Education 1.0 or being used to promote and facilitate what many are calling 21st century skills, i.e., creativity, innovation, problem-solving, critical thinking; those skills characteristic of Education 3.0. Many look at SAMR as the stages of technology integration. I propose that it should be a model for educators to focus on Modification and Redefinition areas of technology integration. Why should educators spend their time recreating Education 1.0 using technology at the substitution and augmentation levels when there are tools, techniques, and opportunities to modify and redefine technology integration for a richer, more engaging Education 2.0 or 3.0? The following chart provides an overview of the ideas discussed in this post. I was excited to have Sieva Kozinsky from Study Soup contact me to discuss my views about educational reform. I appreciate his style of interviewing and his write-up/posting of the interview and the highlights. As such, I am reblogging it from http://studysoup.wordpress.com/2014/01/14/education-reform-with-jackie-gerstein/. Note: It is really difficult for me to watch and listen to myself as well as put myself out there like this but I promote educators using their voice for reform. This is a way to practice what I preach. Time is precious, and school is stealing time away from our students. Our guest today is Jackie Gerstein, Boise State, Walden, Western Governors, and American InterContinental Adjunct Professor and founder of User Generated Education. She has also produced over three dozen Slideshare presentations outlining her views on the student driven classroom. In this talk, Jackie highlights the role of the teacher in the new age classroom, as well as her summary of education 1.0, 2.0 and 3.0. I don’t do teaching for a living, I live teaching as my doing, and technology has AMPLIFIED my passion. 6:05 – Summary of education 1.0, 2.0 and 3.0. 8:40 – A teacher’s role is no longer to provide information or content. The role of a new age teacher to provide expertise in the process. 14:50 – Become a connected educator, get on Twitter! 10:05 – Jackie discusses her point of view on teacher agency. There are a lot of choices out there, but also a lot of restrictions. What can teachers do? Stand up for your freedom as an educator, and become a connected learner! 17:00 – All of your students should be blogging, creating and engaging in the learning process. Twitter – It’s a teacher’s responsibility to be a connected educator, which is the first step towards student driven learning. Worpress.com and Tumblr.com – Free blogging platform for students. Minecraft – A social building game. You can reach Jackie Gerstein on Twitter @jackiegerstein and on her website. 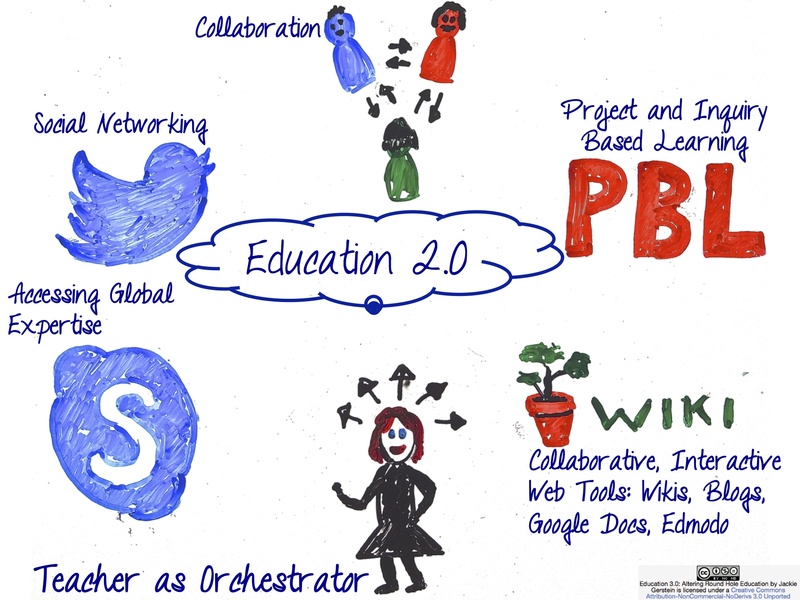 I’m a big fan of her Slideshare on education 3.0 as seen below. In the midst of the implementation of common core state standards and no relief in sight from all the standardized testing, there’s been a breadth of fresh air in the form of maker education entering into many classrooms. The Maker Movement is not easily defined nor placed neatly into a nice little box. It can be high tech or low tech; hacking what is or creating from scratch; it can be creating from building and arts materials or creating on the computer. We have entered into a convergence of several factors that are igniting the maker education movement. The rise of maker culture has been slowly bubbling out of sheds, science labs, tech workshops, in schools and learning spaces. But, suddenly it is very present. The Imagination Foundation that has emerged out of energy and excitement of Caine’s Arcade is raising funds and investing in projects that support maker activities in education. The New Maker Education Initiative, backed by a range of organizations including Intel and Pixar, has just launched its first project called Maker Corps. There are initiatives like the Make2Learn which aims to “leverage DIY culture, digital practices, and educational research to advocate for placing making, creating, and designing at the core of educational practice”. Makers and Teachers Unite! Give kids the tools to develop as creative thinkers who can take on the jobs of the future, seek innovative and resourceful solutions, tackle social issues and find happiness. Help children find and develop their passions through play, hands-on learning and supportive communities. Design scalable Project-Based Learning programs that can be used by a wide range of communities. Technology and the related movements as discussed above have amplified the human desire to create, innovate, share, learn from one another, and have an authentic audience. What was once reserved for those with special skills and often lots of money is now accessible to the masses. 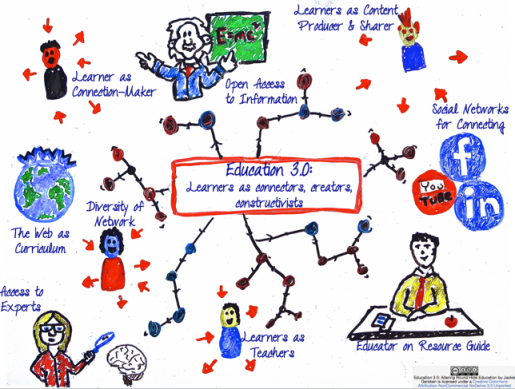 Maker education stems from developments related to Web 3.0 and the evovling Education 3.0 – which is characterized by learners being creators, contributors, connectors, and constructivists. This is the type of education many of this generation are embracing often, sadly, in their “beyond school” learning. These movements, initiatives, technological advancements show no signs of slowing down in the future and hopefully, will change education to better meet the needs, desires, interests, and passions of both educators and learners. Maker education has become a grassroots movement of informal learning as so many are craving and embracing this type of learning. Just maybe, with educators and learners taking the initiative, these developments will work their way into more formal educational settings. The maker movement has the opportunity to transform education by inviting students to be something other than consumers of education. 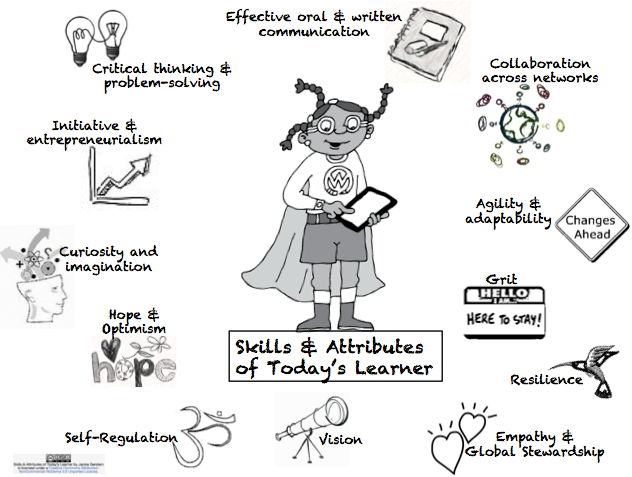 They can become makers and creators of their own educational lives, moving from being directed to do something to becoming self-directed and independent learners. Increasingly, they can take advantage of new tools for creative expression and for exploring the real world around them. They can be active participants in constructing a new kind of education for the 21st-century, which will promote the creativity and critical thinking we say we value in people like Steve Jobs. Learning by Making: American kids should be building rockets and robots, not taking standardized tests by Dale Dougherty, founder, President & CEO of Maker Media, Inc.